Sensei Steven Wong began his Shotokan Karate training under the late Shihan Robert Halliburton in 1973. He obtained his Shodan (1st degree black belt) in 1977 from Shihan Halliburton. In 1989 Sensei Wong was awarded the rank of Sandan (3rd degree black belt) by Soke Hirokazu Kanazawa, 10th Dan of Shotokan Karate International Federation (SKIF) headquartered in Japan. Sensei Wong received his Yondan and Godan (4th and 5th degree black belts) from Shihan Halliburton in 2000 and 2004, respectively. In 2008, Sensei Wong was tested by Soke Kanazawa and was awarded both Yondan and Godon (4th and 5th degree black belts). In 2011, Sensei Wong was tested and awarded his Rokudan (6th degree black belt) by Soke Kanazawa. Sensei Wong, a faithful student of Shihan Halliburton from 1973 until his death in 2008, now continues his Karate-Do training under the guidance of Soke Hirokazu Kanazawa, 10th Dan, Kancho Nobuaki Kanazawa, 6th Dan and Hanshi Jonathan Kwok, 8th Dan-Chief Instructor of Shotokan Karate International – United States Federation (SKI-USF). Our National organization, SKI-USF is under the International umbrella Shotokan Karate-Do International (SKIF). Sensei Cleo Martin began his martial arts training in Tae Kwon Do where he earned the rank of black belt. He also trained for ten years in the art of Judo. Sensei Martin was awarded the rank of Shodan and the rank of Godan by Shihan Robert Halliburton in 1976 and 2004 respectively. In 2010 Sensei Martin was tested by Soke Kanazawa and was awarded both Yondan (4th degree black belt and Godan (5th degree black belt). 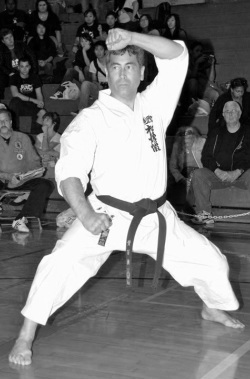 Senpai Chris Linneman began his karate training in 1983 under Shihan Robert Halliburton. He earned the ranks of Shodan and Yondan from Shihan Halliburton in 1998 and 2006 respectively. Senpai Linneman also received the rank of Yondan from Soke Hirokazu Kanazawa in June of 2009. Senpai Darrin Nichols began his karate training under Shihan Robert Halliburton in 1973 and is a second-generation black belt. 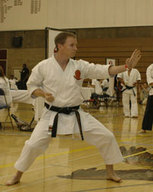 He earned the ranks of Shodan and Sandan from Shihan Robert Halliburton in 1997 and 2003 respectively. In 2009 the rank of Sandan was recognized by Soke Hirokazu Kanazawa and in 2011 he tested for and was awarded the rank of Yondan by Soke Kanazawa. 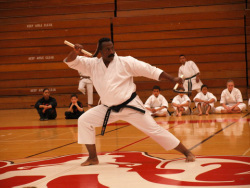 Senpai Cedric Rowe began his karate training under Shihan Robert Halliburton in 1972. He earned the rank of Shodan from Shihaan Halliburton in 1975 followed by Nidan and Sandan in 2001 and 2007 respectively. He was awarded the rank of Yondan under Soke Hirokazu Kanazawa in 2011. Senpai Rowe is an active competitor in both state-wide and international competitions.